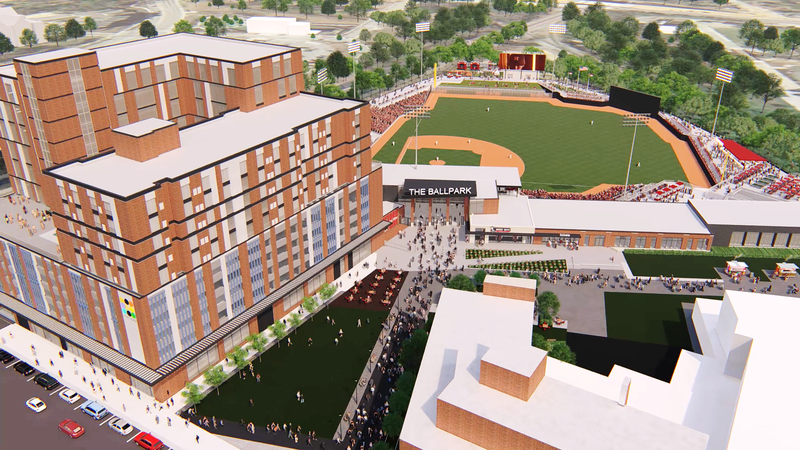 Nestled between two sets of train tracks in downtown Fayetteville, North Carolina, is Segra Stadium, a new baseball park that is expected to breathe new life into the community when it opens this spring. Much like the train tracks that eventually converge out beyond left field, the ballpark project came to be through a happy confluence of events. Back in 2016, the city commissioned a feasibility report to examine whether constructing a sports venue would be economically viable. Results indicated that Fayetteville would serve as an attractive location for a minor league baseball team, according to Kristoff Bauer, Fayetteville’s deputy city manager. Coincidentally, Major League Baseball’s Houston Astros were looking to replace their California League Class-A Advanced affiliate with a team in the Carolina League. In 2016 the Astros and the city of Fayetteville signed a 30-year operating agreement for the affiliate. Now the city is set to welcome the newly named Fayetteville Woodpeckers, bringing minor league baseball back to the area for the first time since the Cape Fear Crocs, a Montreal Expos affiliate, moved away after the 2000 season. Segra Stadium, with a capacity of 5,292, is also being marketed as an entertainment venue, offering a variety of seating for fans watching a baseball game, enjoying a concert or simply looking for an outdoor space to have a drink. The venue includes a club space for 302 people, six luxury suites, a 150-seat party deck and berm seating for 364. More than 50 televisions can be found throughout the park. The area surrounding the venue has been refreshed as well. Nearly $100 million in private investment has been poured into the revitalization of the downtown area, something the city has been working on for the last two decades. “Twenty years ago, our downtown was not reflective of the kind of community that we wanted to have,” Bauer said. “So we moved a lot of businesses that were not consistent with our community values out of the downtown and have been working to try and bring the right kind of development back into our downtown.” This meant investing in public spaces such as the adjacent U.S. Army Airborne & Special Operations Museum, as well as nearby Festival Park, which can be used to host special events. The development includes the restoration of the historic Prince Charles Hotel, a $17 million project that will convert the space into apartments, restaurants and shops. A new Hyatt Place Hotel office tower is expected to attract a high-end clientele, and a residential structure is also in the works. Under the terms of the operating agreement, the city will have the opportunity to host events at the stadium, but a majority of the booking and programming will fall to the Woodpeckers. That programming will include music events as well as high school football and baseball games. 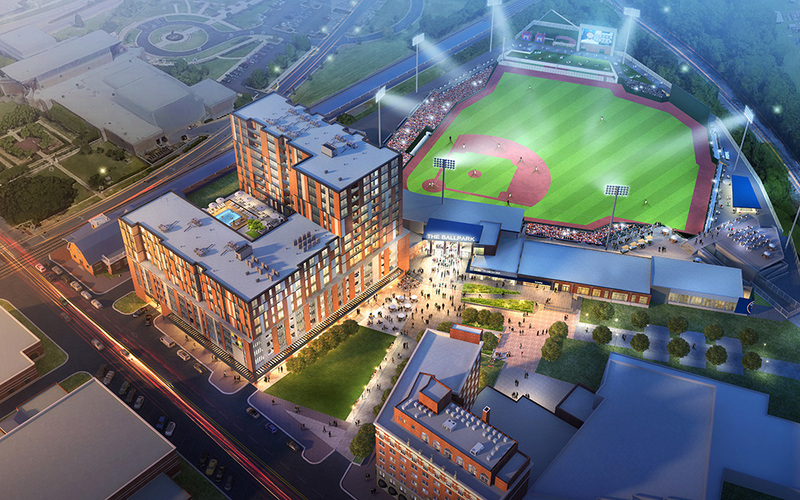 The Big South Baseball Championship will be held at the stadium from 2019 to 2021. Construction on the stadium is on track to be completed in March, with a ribbon-cutting ceremony set for April 13 and opening day on April 18. “The downtown community and surrounding neighborhoods are enthusiastic about opening day,” Zarthar said. The Woodpeckers are especially excited to promote the stadium among the military personnel at nearby Fort Bragg. Bauer, for one, believes that events of all sizes will be taking a closer look at everything Fayetteville now has to offer. “We have major league facilities at a minor league price,” he said. Rookie Card examines new sports events being launched and new sports venues ready to open. For consideration of a new event or venue, contact Senior Editor Jennifer Lee at jlee@ntmllc.com.